Conference events began Friday, October 17 with advanced training opportunities. 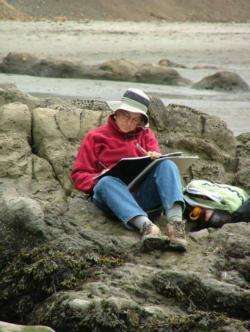 Being a California Naturalist is a commitment to life long learning. Conference training opportunities were selected carefully to improve Naturalist's understanding of California's ecosystems, stewardship, observation, and interpretation. In the hands of a naturalist, outdoor writing can be a powerful tool for discovery and a conduit to a more resonant relationship with the larger-than-human world. In this session, we will write to cultivate powers of close observation, vivid description, and enhanced perception. Sharing and discussion will complement instruction and solo writing time. As we match language to natural phenomena, the objects of our attention will also teach us about ourselves. The insights that emerge through this process can be surprising, the written products artful. Teachers and docents will be able to adapt these methods for use with students of all ages. Sarah Rabkin is an author and science journalist by training and a high school science teacher and college writing instructor by profession. A longtime faculty member at the University of California, Santa Cruz, she is known for her award-winning courses in writing, literature, journalism and environmental studies; she also leads field workshops in the mountains and coastal areas of California and Oregon. practice using these as a form of extended cognition. Everyone will then go into the field, and make an entry in a style new to them. We will conclude by sharing and reviewing the variety of skills one can incorporate into future outings. Upon completion of this course participants will demonstrate a variety of notebook entry techniques using multiple types of media and technology. Russel DiFiori is a biology professor at Pasadena City College and has been teaching a California Naturalist program since 2012. He also leads field programs across the western US and northern Mexico as well as teaches workshops and specializes in studio based learning and outdoor education. Sara DiFiori is a Geology professor at El Camino College in Torrance California, and she regularly takes her students camping in National Parks. She created an ongoing STEM for Educators conference that emphasizes using nature as a classroom. Sara has also led Chautauqua for the NSF demonstrating interdisciplanary explorations of California's central coast. 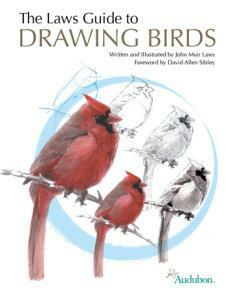 Have you ever wanted to quickly draw birds in the field, capturing both their live energy and the details you can see? This bird sketching workshop will give you the tools you need to draw birds on the move. No previous drawing experience necessary. We will begin with sketching fundamentals, adapt these for moving birds, develop an understanding of bird anatomy and proportions, and learn speed drawing tricks. We will explore the anatomy and basic drawing tricks for songbirds, hawks, waterfowl, and shorebirds. Naturalist, educator and artist John (Jack) Muir Laws is in love with the natural world and has lived his live sharing this passion with others. He is trained as a wildlife biologist and is a Research Associate of the California Academy of Sciences. Jack has taught nature education teacher since 1984 in California, Wyoming, and Alaska. He teaches the tools to help people develop as naturalists and stewards including, ways to improve your observation, memory and curiosity, conservation biology, natural history, scientific illustration, and field sketching all while having fun and falling more deeply in love with the world. Materials: Participants should dress for the weather, wear non-slip sole shoes and bring shoreline field guides that they have available. Snacks and drinks will be on hand. This training will advance your understanding of intertidal ecology and reveal intertidal activities suitable to share with all ages. 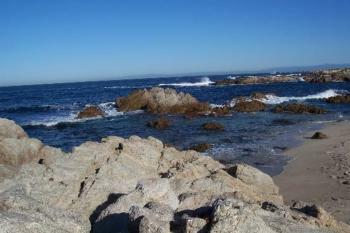 While observing tidepool and beach etiquette everyone will have the opportunity to learn about common organisms and to practice fun and engaging hands-on activities while exploring and investigating the rocky and sandy shore intertidal zones. We will conduct activities using beach wrack, flotsam, jetsam and living animals (such as hermit crabs and periwinkles). We will practice a no harm ethic in handling live animals. You will have a chance to identify some common shoreline organisms using field guides and online resources. Discussions will include ideas for interpretive variations of the activities including applications to estuary, wetland or other marine habitats and issues and ethics about exploring and conducting activities at the shoreline. Steven Cochrane is incredibly knowledgeable about California’s natural places, the plants and animals that one can find there and has many other amazing naturalist skills. He has a degree in ecology and organization administration focused on volunteer management and currently works as a field biologist at LSA Associates, Inc. This workshop offers hands-on training using hand-held GPS receivers and other mobile technologies and is designed for participants with little to no experience. You will learn all about what GPS is and how it works. Various mobile platforms that can be used to collect location and field observation data will be discussed. Participants will also get to see how to use free computer software to view and use the data. You will return home knowing how to upload points in the field using a handheld low priced GPS unit and ways to take advantage of your smart phone or other mobile device for field data orienteering and data collection; and how to download points to a computer. Sean Hogan is an Academic Coordinator and trainer for the UC Agriculture and Natural Resources statewide program Informatics and Geographic Information Systems (IGIS). Learn tricks and techniques to help you include sketches, diagrams, and drawings in your field notebook. 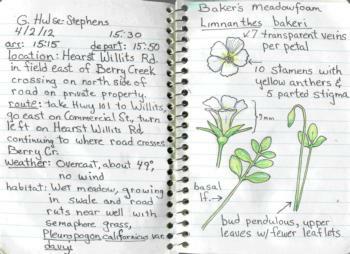 You will learn methods that will help you draw landscapes, trees, wildflowers, mammals, mushrooms, and other objects often discovered in your nature rambles. Learn basic drawing techniques and a workflow that can be applied to drawing any subject. Discover how to get a sense of depth in your drawings, and how to complete a landscape drawing in five minutes. You can do this and there is no experience necessary. These techniques can also be taught to your students to help them get started with their own drawings. 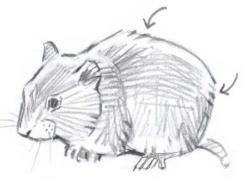 Vole showing out to in flicks or “Bill Berry marks”, suggesting breaks in the fur. © John Muir Laws. Naturalist, educator and artist John (Jack) Muir Laws is in love with the natural world and has lived his live sharing this passion with others. He is trained as a wildlife biologist and is a Research Associate of the California Academy of Sciences. Jack has taught nature education programs since 1984 in California, Wyoming, and Alaska. He teaches the tools to help people develop as naturalists and stewards including, ways to improve your observation, memory and curiosity, conservation biology, natural history, scientific illustration, and field sketching all while having fun and falling more deeply in love with the world.